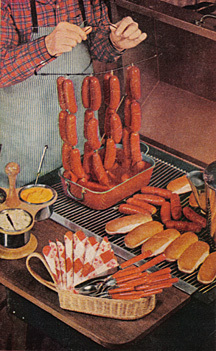 While perusing my beloved 1956 Better Homes and Gardens Barbeque Book, I came across an overlooked recipe that might be of interest to the retro grilling enthusiast…Puppet Franks with Catsupdip (one word). That’s right, weenies on a string. Modern and convenient! How does it work? Simple. Using a metal skewer, string “short chubby-type wieners” together using heavy duty string making sure to tie a knot between each frank to ensure that they don’t all fall off. Perhaps a good candidate for this would be a new type of frank I have just seen that is about the size of a bratwurst. Slash the franks on both sides. Once 6-10 franks are strung together in this manner, double them over a wire coat hanger making sure to loop the strings twice over the hanger to secure. Once your strings of franks are on the hanger you can lay them onto the grill allowing the hanger to dangle over the side. When one side is done just the way to like them, pick up the hanger and flip the whole thing over onto the uncooked side. Grill until done then dip the franks thoroughly in Catsupdip. 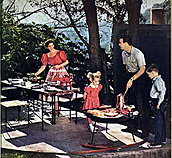 It is suggested that the host serve guests by carrying the dripping hanger around and snipping off individual franks with scissors. Nothing could be more dramatic at an outdoor gathering than to play the role of the consummate protein puppet master plying his ancient art for an eager audience. Serve extra Catsupdip as needed. Combine all ingredients. Simmer uncovered for 15 minutes. Makes 3 cups or enough sauce for dunking about 2 dozen wieners. Be careful and don’t hurt yourself with this one kids. It’s time to get those summer patio parties underway, and Patio Culture can help. Need a classic retro cocktail recipe for your next gathering? Look no farther than our latest piece of space-age technology, the Lounge-o-Lizer! 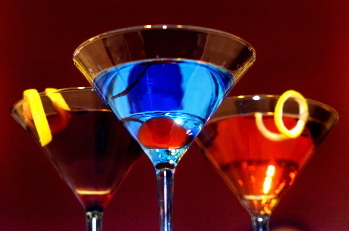 We’ve loaded authentic outer-directed cocktail recipe favorites that keep superfluous fruit to a minimum. More like Mad Men than Nouveau Tiki. Just visit The Patio page and push the launch button! This summer I’ve decided to go off theme a little bit with my grilling style. Of course I’ll still be doing retro favorites like steaks, hamburgers, and barbeque (which is not grilling), but I’ll also be posting more Asian and Latin American specialties that I’ve gleaned from the web, as well as posting some of my own recipes. On the Grill Today: Tacos with Pollo al Carbon, charro beans, curtido (pickled cabbage salad), and salsa muy asada roja. For Father’s Day I whipped up a little Norteño/Salvadoran menu that goes great with the grill. No, I haven’t forsaken my beloved Tex-Mex! I still consider it the premiere cuisine of Texas on par with any the regional (interior) cuisines of Mexico and the Southwest. Tex-Mex had the unfortunate timing of going mainstream about the time the huge taco chains began to dominate the fast food industry, thus the bastardized corporate version became what most non-Texans regard as “Tex-Mex”. No so, but that’s another post! I consider this “interior” version of Pollo al Carbon to be Norteño (northern Mexican) since it’s grilled over coals in the traditional fashion. The vaqueros of the northern desert, however, would have undoubtedly have eaten the beef version of this! Don’t worry, chicken is an acceptable choice for we petroleum-deprived suburbanites. Saute onion, garlic and tomatillos in oil until soft. Add juices and spices. Simmer for about 10 minutes while stirring. Set aside and allow to cool. Place chickens in a large container or large resealable bags. Cover with sauce and refrigerate for 3 to 4 hours (I did it overnight). Preheat grill. Remove chicken halves from marinade and place on medium hot grill. Grill for about 30 minutes turning occasionally and basting with reserved sauce every 10 minutes. Do not baste in the last 10 minutes of grilling. Remove when done and serve with salsa and tortillas. I top the tacos with queso fresco and garnish with radishes, limes, and tomatoes. Bowl of charro beans when the author suddenly remembered to photograph it. Half eaten and unphotogenic, it was nonetheless delicious! Place the beans in a large pot with half the onion, half the garlic, oil and epazote. Add 2 quarts water, bring to a boil, cover and simmer for 1 1/2 hours or until tender (35-45 minutes if done in a pressure cooker). Add salt to taste. In a large saucepan or clay casserole, cook the diced bacon until some of its fat is rendered, add the remaining onion and garlic, and saute until the onion softens. Add the tomato and chile, and continue cooking until the tomato releases its juice. 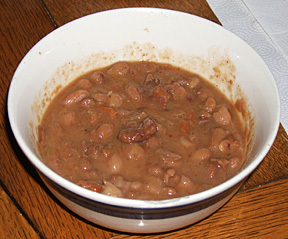 Add the cooked beans with their liquid and cook over a low flame for 20-30 minutes, stirring from time to time. Taste for salt. Serves 12-15 (I make only half of this recipe). Place everything but the salt in a large iron skillet (or nonstick frying pan) making sure that all items make contact with the metal. Turn on the heat and let the vegetables get burnt on the outside. Turn as needed to insure this…don’t worry it’s okay. Once the vegetables are nice and charred on the outside, remove them and deglaze the skillet with some water. Add the vegetables, salt, cilantro, and just enough of the deglazing water to keep the salsa thick and blend to a somewhat chunky consistency. You should end up with a rich, smokey, almost maroon colored salsa! 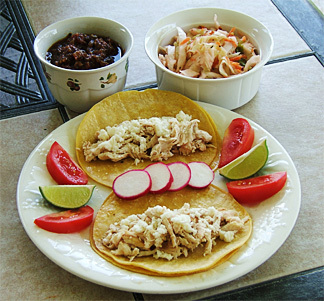 This dish form El Salvador is traditionally served with pupusas (filled tortillas). Some folks put it on fish tacos, so I thought it would go with my tacos as well. Combine all ingredients in a large bowl and mix well. Cover and refrigerate for at least 6 hours. Let the liquid drain from your portions as you serve them. Note that some recipes call for blanching the cabbage in boiling water for one minute before mixing. I’ll think I’ll do this next time since the marinade alone did not quite soften the cabbage as much as I would have liked. This is related to saurkraut and kimchee so it keeps for awhile.